There is a certain feeling that watching Wolf Children gives you. I have only had this feeling twice in recent memory. The first was when I read the novel Looking for Alaska in the summer of 2013. The second was when I watched the anime Gurren Lagann in January of this year. This feeling is one that is unexplainable, but clearly obtainable. It appears only when you consume a piece of fiction that connects with you more strongly than anything in reality can. I won’t declare it as my favorite film of all time just yet, but Wolf Children is, without a doubt, one of the greatest movies ever made. Mamoru Hosoda has been slowly rising up in the anime industry over the past decade. Some of his most iconic works include Summer Wars and The Girl Who Leapt Through Time. However, Wolf Children is the first film in his repertoire that truly places him right next to the legendary anime filmmaker Hayao Miyazaki. 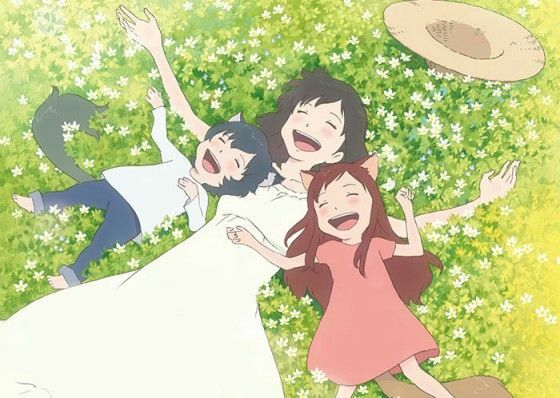 Wolf Children, on the surface, is about a young woman trying to raise two children all on her own. However, these children are half human, half wolf; they can transform into either at any given time. What makes this seemingly basic plot so remarkable is its hidden depth. Upon analysis of the film, you begin to realize that the lycanism of the children is just a mere metaphor. This metaphor portrays the struggles of anyone raising children with disabilities, mental illnesses, or other various characteristics that society deems abnormal. The characters, though seemingly basic on the surface level, are much more than that. The purpose of the simplicity of the characters in both design and writing is to allow the audience to seamlessly fall into their shoes. You feel every emotion they feel with intensity, and begin to form extreme empathy for these people who do not actually exist. Therefore, the happiness and sadness that these characters feel becomes all the more potent. It took all my strength to hold back tears in front of the anime club that I watched this movie with. However, I guarantee that if I watched this alone, I would have been bawling. Without a doubt, the best part of this movie is the animation. While the character designs are purposely simplistic (see point above), the backgrounds and environments are anything but that. This movie has the hands down best animation in an anime ever. Every single setting is extremely colorful, detailed, and enticing. This becomes extremely prevalent when the characters move from the city to the countryside. The final factor that makes this movie outstanding to me is the minimal use of dialogue. Don’t get me wrong, there are a multitude of heavy conversations throughout the movie, as well as a narrator. However, if you compare this to other movies, particularly anime films, you would find that there is probably half the amount of conversation. The soundtrack, character expressions, and environment animation tell the story much better than any dialogue would have done. To conclude, you can tell I loved Wolf Children. I would recommend it not only to anime fans, but to literally anyone. Some of it may be a little too dark for younger children, but it would be a great film to show them when they are a bit older. However, this movie was clearly not made with a certain demographic in mind. Anyone from any walk of life can watch it and identify with it. Wolf Children is a timeless masterpiece that breaks the boundaries of what film can do, and is the best movie I’ve seen in a very long time.